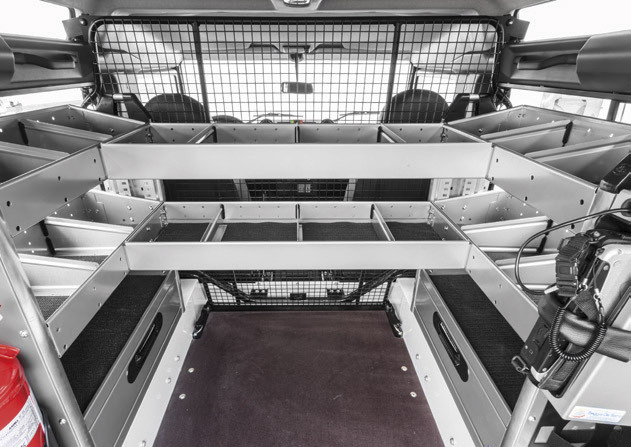 We organize the space of each van and improving its capacity. Our objective? 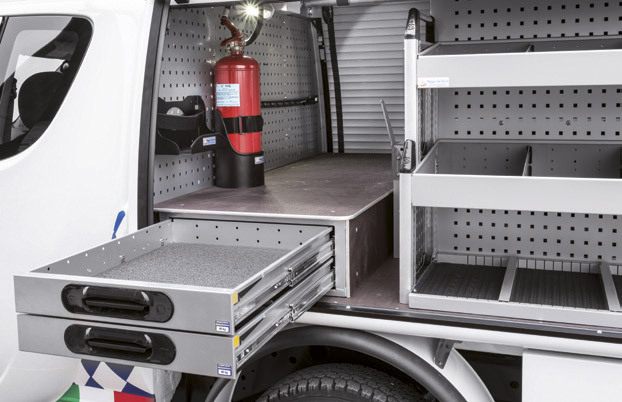 Making the interior equipment rational and safe. 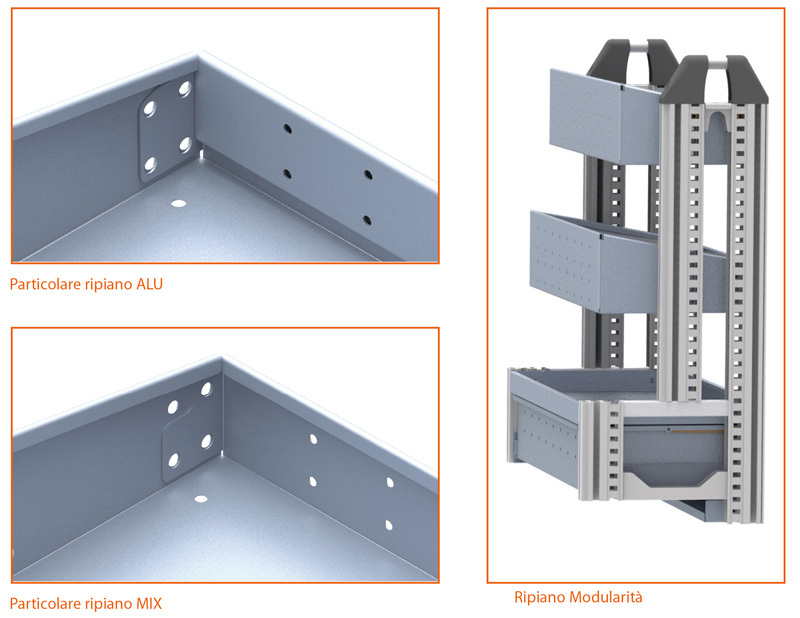 The innovative upright “Just Fix”, created by an extruded aluminum profile, can satisfy every need, creating modular and suitable solution for any wall. 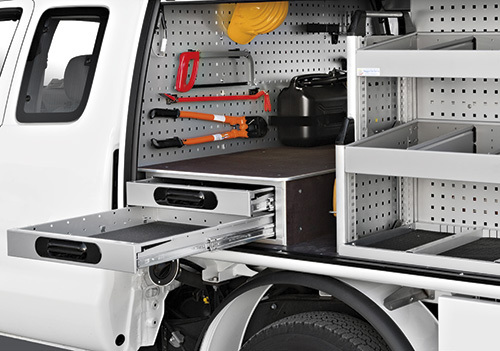 Shelves closed and bordered on all four sides, with the front edge lowered to facilitate access to the load and pickup the material. 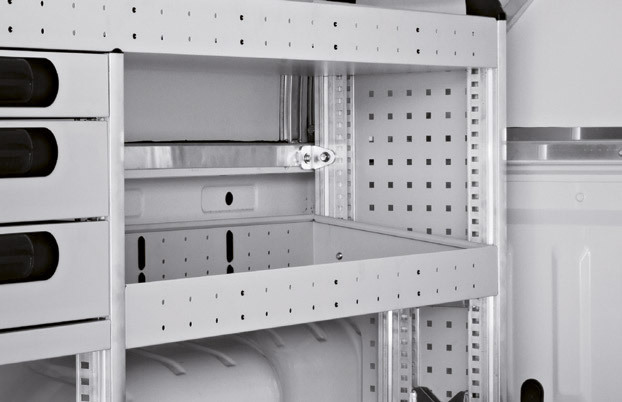 The shelf has perforated to divide the space with dividers and fix the shelf overhanging to the upright to exploit the convexity of the wall of the vehicle. 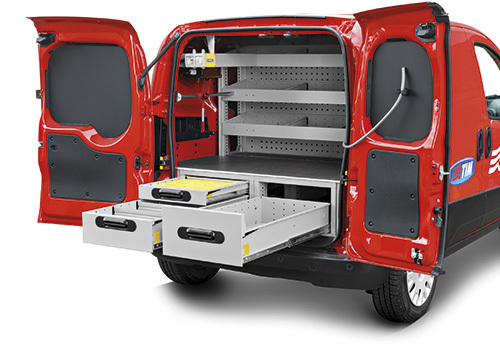 A wide range of solutions offered to solve the management of transport during labour. Ergonomic handle in plastic. 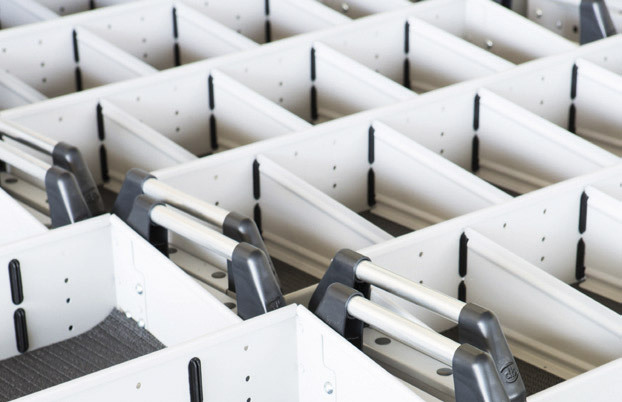 Runner guides robust and compact to minimize the lateral dimensions and obtain a greater loading surface. 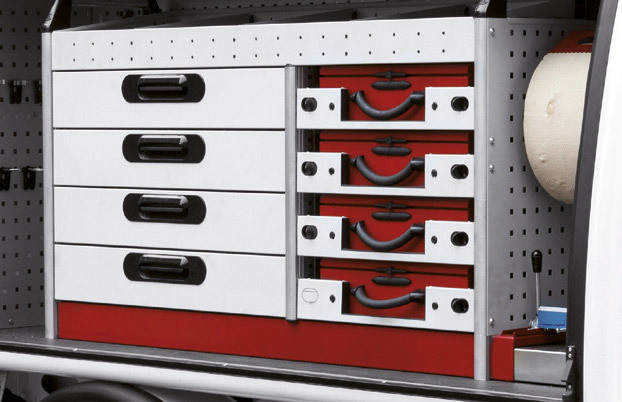 Total opening drawers for easy and confortable access to any loaded. 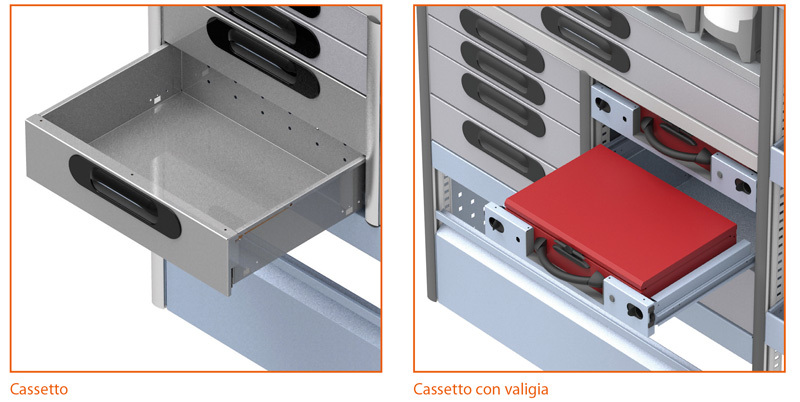 Runner guide with locking system for drawer closed and open. Internal division with dividers and / or plastic bins for small parts. Inserting rubber mat ribbed non-slip, anti-mold and anti-odor. The fundamental quality of aluminum is lightweight. It has a density of 2.7 kg / dm3 against 7.8 kg / dm3 of steel. With the use of this material we can reduce the weight of an equipment of medium of 50% compared to those traditionally made of steel, thus arriving at increasing the residual capacity of the vehicle. 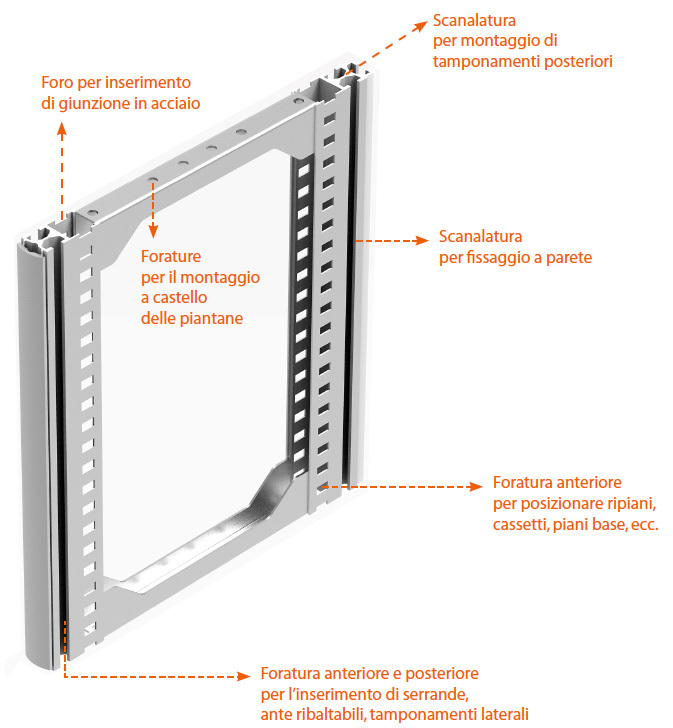 Through a study and an accurate design and thanks to shapings and folds made possible by the use of advanced technologies present in the company, we have obtained loading capacity similar to those that we obtain with the use of steel plate. Products made with this metal are completely recyclable. In fact, from aluminum are obtained again products of the same quality of the products of origin. 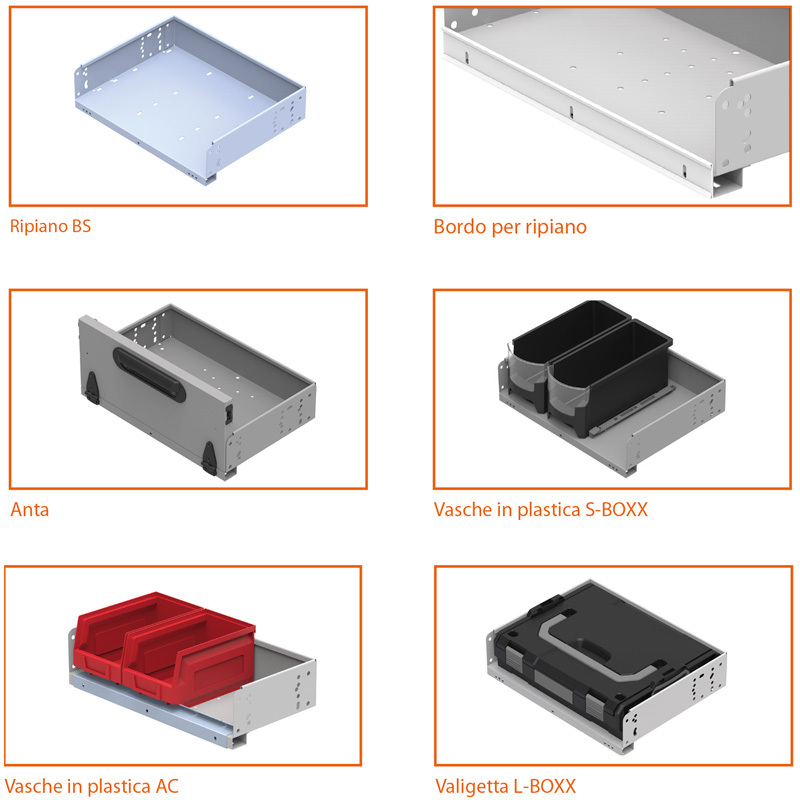 An aluminum core with a steel structure, the internal equipment in steel REVOLUTION MIX combines the versatility and modularity of aluminum uprights with the robustness and the countless variations of the steel modules that allow to meet any construction. The steel modules are fixed firmly to the upright thus forming a single and solid structure. 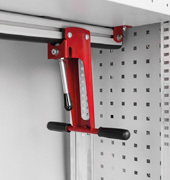 Robust galvanized brackets, fixed to the uprights of the vehicle allow a uniform weight distribution on the supporting structure. 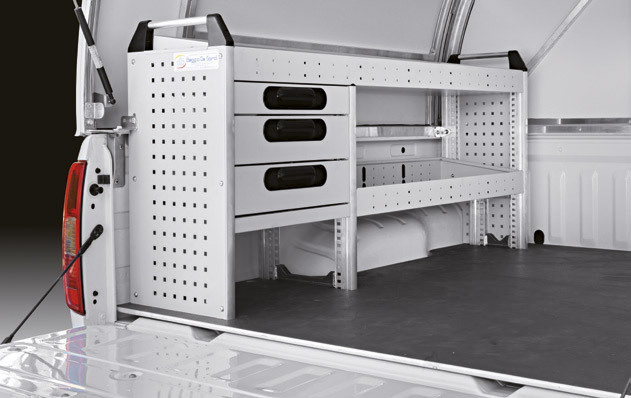 The anchors rails in aluminum can be embedded on the loading floor or installed on the internal walls of the vehicle. 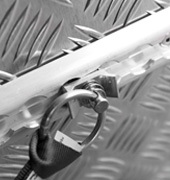 Are completed with rings, hooks, straps that enable the installation of the load in a stable and safe way. 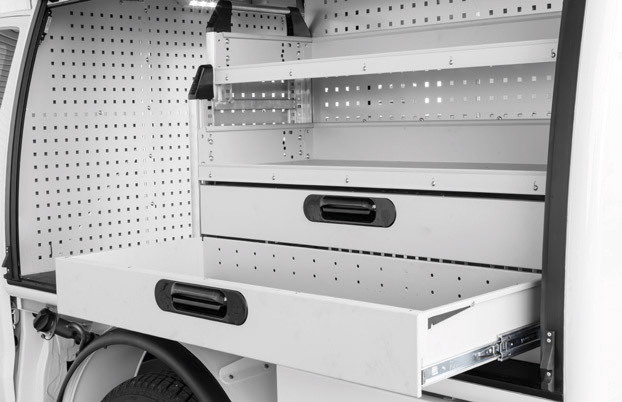 A wide range of accessories complete the interior equipment and allow to store the material in an orderly and efficient. With a choice of these items you can customize your vehicle according to your needs. 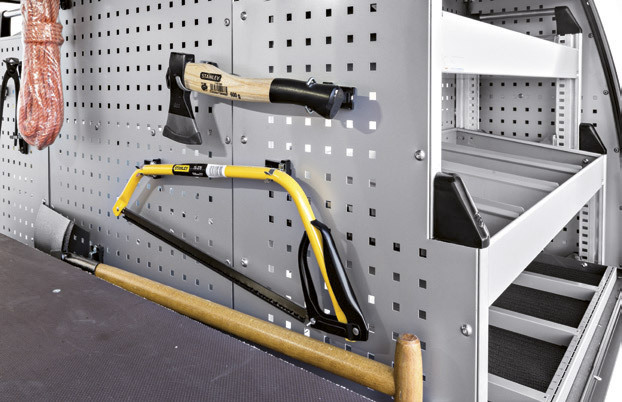 The wide choice of accessories related to the hygiene of the operator and tools help to make the working environment if convenient, comfortable and always clean. 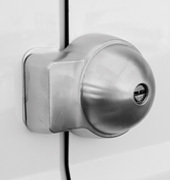 The safety devices installed on the doors protect the load compartment to prevent any kind of forcing. 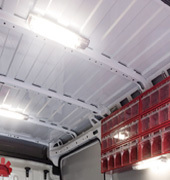 With the installation of LED lamps or halogen lamps, the longitudinal struts of the roof of the vehicle can be illuminated optimal the work space. The system is customizable with switches, sockets, inverters, generators to better meet the business needs. Baggio & De Sordi has always supported the direct relationship and collaboration with its customers. From this report derive specific preparations that aim to solve specific needs. Answering a request gives us the opportunity to study and then offer a customized product.